When I use pickblock (middle click) on a shulker box, it displays the wrong item name in the hotbar. It displays "tile.shulker_box.name" in the hotbar tool-tip. It should give the proper name of the shulker box. See image. 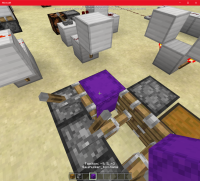 I middle clicked the shulker box and it displays "tile.shulker_box.name" When I scroll over the shulker box in my hotbar is displays the proper text "Purple Shulker Box"